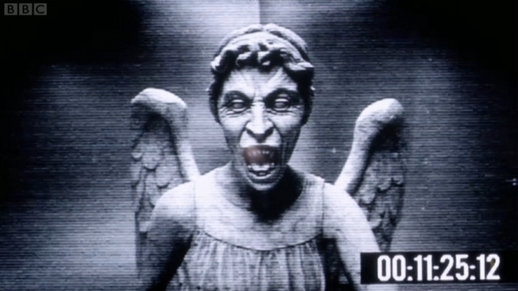 The Weeping Angels are back! What more do you need to know for an outstanding episode of DOCTOR WHO? Okay, how about Steven Moffat is writing it – and he has brought back the enigmatic River Song for good measure. I absolutely love the way Moffat incorporates actual time travel into his plotlines. He really takes the…er, time… to think about how to make it interesting. The sheer audacity of River Song’s plan is awe-inspiring, and another inventively brilliant gambit by Moffat. Her escape ploy makes perfect sense because it doesn’t matter when the Doctor gets her message – he has a time machine, and can arrive in the nick of…yes, time. The character of River Song (Alex Kingston) herself is intrinsically tied to all things “timey-whimey,” as she is from the Doctor’s personal future. “We keep meeting in the wrong order,” he tells Amy about her. And it is no small thing that River Song is a mystery to him; very few people have that honor. In part, this is because he refuses to learn much about her because she is a figure in his future. As River Song herself would put it, “Spoilers!” At least he is still that much of a traditionalist about the laws of time. (That’s quite a backpedal from “The Waters of Mars,” in which he declared the Laws of Time would obey him!) In order to keep track of the Doctor, River Song has pictures of all his faces –a sort of “spotter’s guide to the Doctor” – because he never shows up in the right order. (You might be tempted to suggest this time is the exception, because the 11th persona naturally follows the 10th, but think about what happened in “Forest of the Dead” – she should not meet 11 “next.”) Ever the cool customer, River Song plays it coy when Amy asks if she’s his wife. But there is no playing it cool with a Weeping Angel around. Especially when the plan to capture one rogue angel because a desperate bid for survival among an army of angels! Placing the angels in a dimly lit subterranean setting was brilliant, and made the monsters seem even more creepy. The set design of the Maze of the Dead is brilliant: caverns filled with carved staircases and weathered old statues. 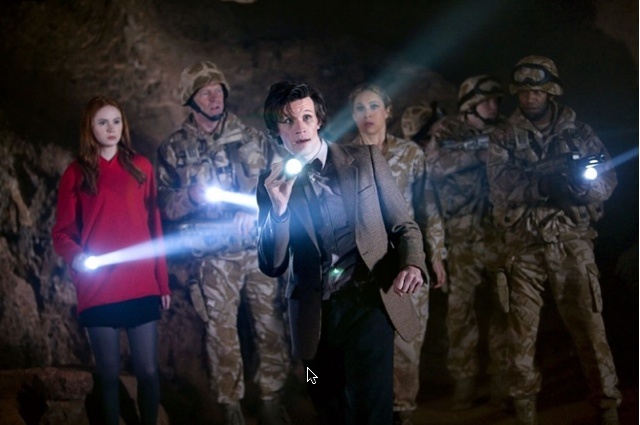 “Every statue in this maze – every single one – is a Weeping Angel,” the Doctor revealed. “They’re coming after us.” So an aura of death and foreboding as thick as shadows cloaked the story. I find the angels terrifying: I don’t know if it’s because of the blank, carved-stone eyes, or the fact that they travel without appearing to move. Motionlessness has never been so scary. They are monsters that don’t do anything. The angels are “quantum locked” in that they literally cease to exist when gazed upon; only stone is left. Moffat adds another layer to their menace by revealing that anything that takes the image of an angel becomes an angel. Thus, a digital recording of an angel can manifest into the real thing. The angels are great, but Amy Pond (Karen Gillan) is shaping up to be Moffat’s most wonderful creation. She could barely contain her glee at landing on an alien planet, and she is completely unafraid to tease the Doctor. “Is River Song your wife?” she asked, trying to wheedle personal details out of him. But my favorite moments came in the sequence when her hand was petrified and she believed she was going to die. Gillan’s eyes filled with tears, but Amy remained stoic. “It’s okay, I understand,” she declared. It was a devastating moment. One that was grandly undercut by the Doctor impulsively biting Amy’s hand to prove it hadn’t turn to stone after all! This entry was posted in Cult TV, Fantasy, Horror, Science Fiction and tagged 11th Doctor, Amy Pond, Doctor Who, Karen Gillan, Matt Smith, Weeping Angels. Bookmark the permalink. STARGATE UNIVERSE 1.17: Oh, the Pain! The Pain!